Some customers often request to deploy MSS behind NAT, but still need provide public service. That means MSS is in private network and some SIP phones/clients are in public network (internet), or MSS need work with public VoIP carriers’ network. (2) MSS is deployed in private network with private address 192.168.1.2. 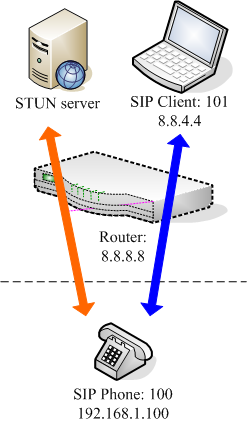 (3) Some SIP phones are in the same private network, such as local users 100 and 101. Some SIP phones are in public network, such as local user 102. It is no problem for local user 100 and 101 to visit MSS since they are in the same network. So the problem is how to make outside local user (102) can visit MSS. We can resolve it by forwarding some ports in router. First, in the router, we can configure forwarding UDP port 5060, 10000~20000 to the PC where MSS is installed. Most routers can support this function. Port 5060 is standard SIP port. Ports 10000~20000 are RTP ports to transfer media streams. Second, we must indicate MSS to work with public address. Please click menu “Data / System / SIP” and fill the “Public address” with the public address “8.8.8.8”. SIP phones/clients can use this public address to visit MSS. There is another problem. In above scenario, the router is configured with a fixed public address. In normal, the router could be ADSL router and it maybe has a dynamic IP address. Outside users cannot use the dynamic address to visit MSS. Then, how can we provide public services? SIP phones/clients must be able to use domain name as server address or proxy address, so they can configure “sip.dyndns.org” to visit MSS in our scenario and make calls. Almost all of us will meet this problem when we deploy our first VoIP network. We are often confused: why I cannot hear peer guy but he can hear me? why we cannot hear each other? In this simple network, we have two VoIP devices, one is SIP phone whose number is 100, another is SIP client whose number is 101. 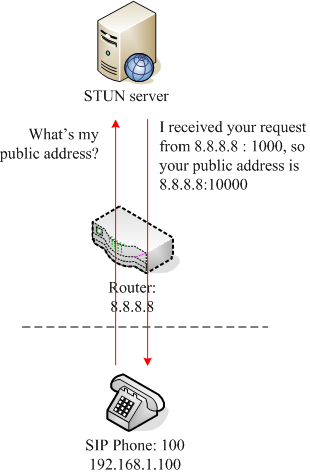 SIP phone is in a private network and its private address is 192.168.1.100, and its router is connected to public network with address 8.8.8.8. SIP client is installed in one PC which is in the public network with address 8.8.4.4. 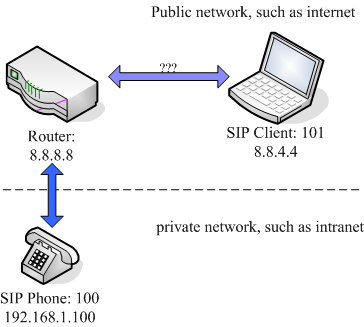 So when SIP phone makes a call to the SIP client, what will happen? SIP phone say: Hi, I am 100, my audio address is 192.168.1.100. Please send audio stream to me. SIP client answers it: ok. I am 101, my audio address is 8.8.4.4. Please send your audio to me. SIP phone sends audio stream to SIP client. 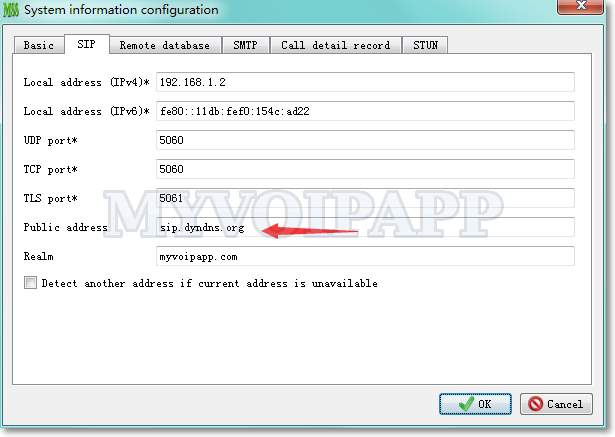 Since “8.8.4.4 ” is a public address, it is no problem for SIP client to receive the audio stream from SIP phone. That means SIP client can hear SIP phone now. SIP client sends its audio stream to SIP phone “192.168.1.100”. 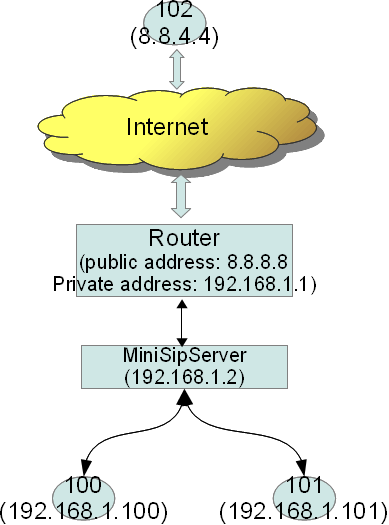 You can see it is a private address and cannot be reached by SIP client which is in public address. SIP client will fail to send its audio stream to SIP phone in fact. So finally, SIP client can hear SIP phone, but SIP phone cannot hear SIP client. This is a very typical one-way audio problem.